I expanded my artistic skills to try woodworking projects and sometimes it was challenging. The hardest and least fun was disassembling some pallets whereas those nails can be too strong and sturdy for the uses of them. Nevertheless, I have no desire to do that but on the other hand, I have so much wood for lots of projects to complete my coastal wall art in my bedroom. The total cost to add to my beach theme home decor with a coastal charm was under $50.00. "Wooden driftwood shelve and display coastal wall art"
DIY wood project coastal wall art. ￼ I love this! It was an inspiring project. Digging through free wood I found these and tried to find as many as possible but only found a few. It took the longest time to figure out what to make. I used a piece of driftwood for shelve and varnish on it. big companies that make mass production of woodworking materials such as Master Brands. Ask your local hardware store in the backyard where all wood is stored if they have free wood. Now Home Depot asks for a percentage whereas Diamond has three huge storage boxes of so many different styles and colors to choose from. It does cost .50 cents to cut any wood but if your cute, a little filthy, and ask nicely then it's free. has inexpensive pictures of everything yet it was hard to find sea or ocean wall art framed. is similar in frames boxes of attractive and trendy framed photos of a huge variety. making driftwood shelves, adding glass jars with seashells you've collected, or any netting for wall art. The beach wall art was from thrift stores as a total cost of $4.00 half off. The entryway table was so hard to come up mainly how to put the table top with some kind of legs. The table top was 5ft long and 10" wide with snap together pieces of wood. Free. After about two months of trying to find, within my budget, the base of it came to me one night with one pallet that was an extra piece I was going to return. I am not at all good with the measurements of wood making but I have the highest level of math skills from college with A's, I had to redo several times the find middle part to make the base able to balance and stand up sturdy and stable. Seashells and treasures of my huge collection to accent the other pieces of table decor. My own beach cottage entryway table that is one of my favorite pieces of furniture to own. Entryway made with free wood and pallet for coastal home decor. As an example of them, I bought 4 or 5 bundles of decorations illustrated in the picture for $1.00 each. They had no ocean colors so what I did to produce my own design I painted some of them different colors of the ocean. The stunning case was purchased a couple of years from another business friend for only $40.00. "Inspired accented pillows for a calm and soothing colors"
I had this free couch with an ugly plaid look so a few years ago I bought a fitted couch cover. "Coastal photo wall art collage"
"Pallet Shelve with displaying my seashell collection and lighting around it"
This was easier than you think because you find several types and styles of pallets so look for ones that have this on one side and the only top part are 3 pieces of boards lengthwise. The color of this was a mixture of blues using chalk paint and after it dried I sponged on white paint later. Every picture was only $1.00 each. total $8.00. 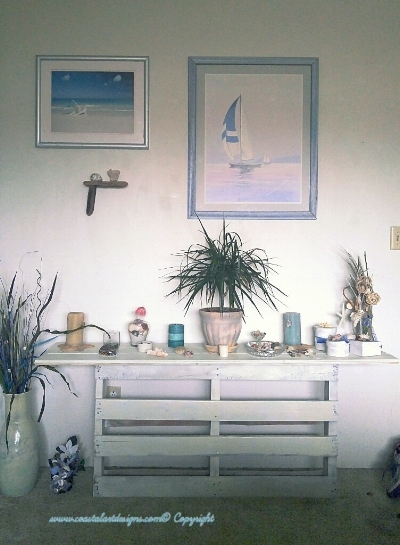 The one picture was bought a year ago and the driftwood shelves are my wall art for purchasing if desired. The wood projects are available to purchase. "Pallet style headboard with nautical starfishes"
Example, of one of the many styles of pallets that they make and are rare to find. As I drive home from the store I take a scenic route and drive by where they pile pallets just to see if anything is appealing. This was an awesome find. Two pieces of frames I used and adding sky blue nautical starfishes. When I decided to make my bedroom into my cozy and comfy place, I never knew you had to learn about buying the right designs and quality of a bedding set. Now I know that the thread count is important but I can't remember what I purchased was, only that "there not wrinkle-free!" I hate that feeling and look but the biggest joke on me is before I never ironed a thing! Now, look at me. In spite of the fact that it was more than I wanted to spend because I search for the best deals, I still went through with it and I LOVE IT! It is very cozy and so warm and with a down feather padding on top of a memory foam mattress set with silky sheets and to top it off a down comforter with dovet from Bath, Bed, and Beyond. ($1000.00 total). There's different ways to decorated your bedroom with a T.V. stand or just a stand with a pallet shelve to go above it. I found the three tier shelve out in front of the street corner. Someone was giving it away free. I painted it and it turned out pretty cute. Please read my disclaimer do this website does receive a commission from advertisers that I have links and ads on my website where you might click on and decide to purchase or sign up with using them.